Do rules have specific datasets associated? Pretty straightforward really. I can see a dataset called Date Variance (Random), Text in the Misc Setup tab. 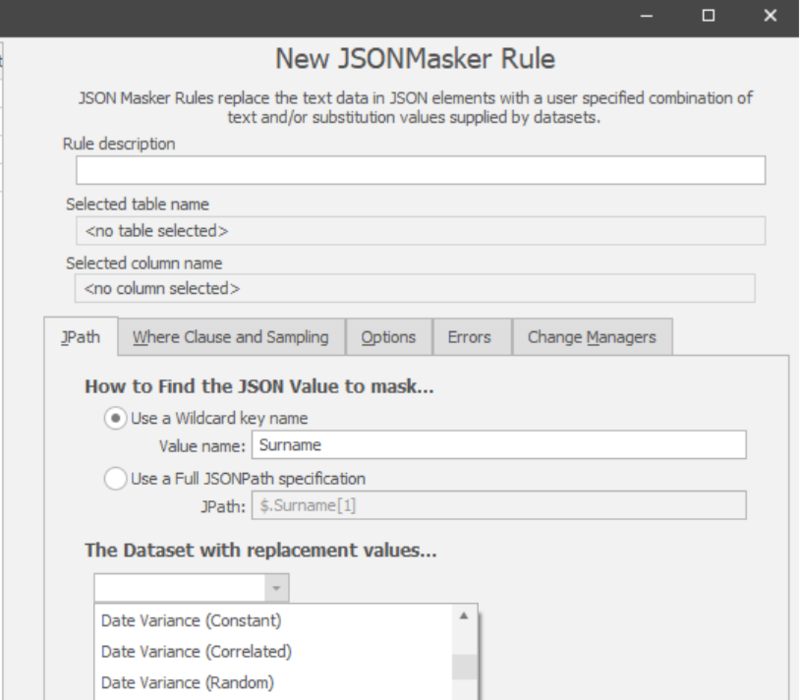 When I select the JSON rule, I can't see that dataset available. If it is limited, am I able to create a copy of this dataset that I can upload as a user defined dataset and have that be available for use in this scenario? Hi @AndrewH Thank you very much for your post - I can see that when I open the JSON masking rule I do indeed have access to this particular DataSet (see attached picture), are you able to share what you're seeing at all please? If you still can't see this have you tried downloading the newest release and updating just in case? Thanks for the response but you're finding a slightly different dataset, one without the ,Text on the end. I can see all those datasets in your picture but I wasn't sure it would work with ISO8601 format inside my JSON. I'm looking for this dataset - Date Variance (Random), Text. Using this dataset, I can manually select the exact format I need. Thanks @AndrewH I will catch up with the development team and see if this is a bug and if they're able to generate a fix for you, or if we've just missed something and there's another way around it!